Roman entertainment was varied. Romans had many forms of entertainment and plenty of holidays. There were 180 holidays in the early empire and on many of these days Roman citizens did not work. Emperor Marcus Aurelius later decreased the number of holidays to 135 in order to improve the economy but a hundred years later the number of holidays reached 200 days! 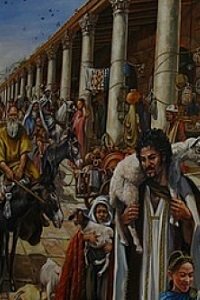 Each holiday was mostly a religious holiday, people would go to the temple to leave an offering and priests would walk through the streets and lead a procession. The main form of entertainment was the Roman amphitheater where Romans would watch gladiators fight wild animals or each other or Christians getting devoured by lions. These gladiator fights would sometimes reenact battles. For example, the Colosseum in Rome, which could seat 50,000 spectators and which was built with the spoils of the first Roman-Jewish war, would reenact naval battles. It would be flooded with water and gladiators reenacted these battles and fought to the death. Romans would also go to the Roman stadium (circus) to watch chariot races, just like we go watch NASCAR or Formula One races today. Not much is left from the circus in Rome which could seat 250,000 spectators but if you go there, you can still get a good idea of its length and size as one of its tracks is still visible. 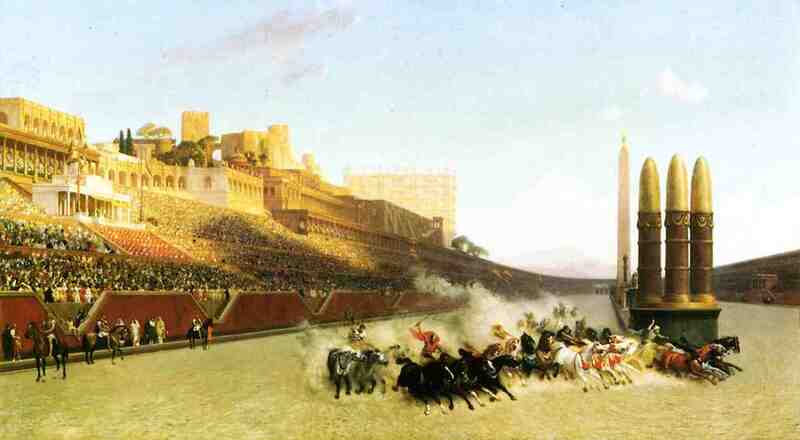 Rome actually had 8 stadiums for chariot races. The chariots used were very light, fit only one person standing up and they could be pulled by up to four horses. Just imagine the speeds at which the four horse chariots were racing around. When a charioteer would crash, his chariot would be pulverized. He would be ejected from the chariot and often badly wounded. The movie Ben Hur gives a great reproduction of these chariot races. Going to the thermae almost everyday was another form of entertainment for the Romans. They would usually go after work at around 3 to 4 o'clock and spend a few hours there socializing with friends. Visit our page related to Roman bath houses. Romans would also go to the theater. Many Roman theaters still exist today. They were semi-circular, with many rows of seats that could sit thousands of people going up from the base. There was an orchestra at the base, and behind the orchestra, a stage facing the seats where actors would perform. Many of the performances were related to religious festivals to honor the gods. Theaters would play comedies, farces, tragedies, pantomines. The theater would often get noisy as spectators would chit chat while watching the play. Sometimes spectators throwed objects at the actors when they didn't like the play! The campus was like a large playground for Romans which contained a field and tracks. Romans went to the campus to participate in sports such as running, wrestling, boxing, fencing, etc. Other sports involved throwing a ball as high as possible and catching it before it hit the ground. After a few hours of good exercise at the campus Romans would go in the Tiber River to refresh themselves or to the thermae to relax and wash themselves. Romans would also have dinner parties held in the triclinium of their house which would last for long hours. Romans would recline on sloping couches situated around a table and would eat with their hands. Sometimes their would be actors performing a play or dancers to entertain the guests. Rich Romans would stay at these parties until very late and used oil lamps when it got dark. Poor Romans could not afford these oil lamps and would go to bed early. 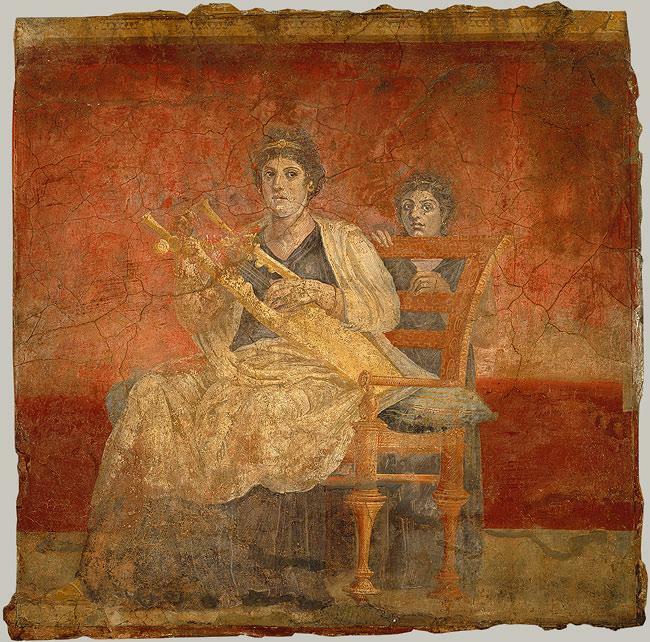 For more information of the triclinium, please visit our page related to Roman food. Romans would go to the Forum to go shopping. The Forum contained many shops that sold everything from food to jewerly. Romans would go to the Forum to shop but also to socialize with other people. Rome also had the equivalent of shopping malls and some were for rich people and contained only expensive stores. Romans played many board games and many have been found. Unfortunately archaeologists cannot figure how they were played. Many board games even used dice just like today. Board games were popular especially with the soldiers who would spend hours playing in order to kill time. Hunting was another form of entertainment. Romans hunted not only for food but also for fun. They hunted deers, rabbits, birds, etc. Many for the forms of entertainment be it the coliseum, the theater or chariot races were free. The Roman government would often cover the costs as a way to please the masses. Rich Romans willing to obtain the favor of the Gods would sometimes pay for the costs of a play at the theater. Actors at the theater were always men. Female actresses did not exist. Acting was a very low-paid profession and was also considered a vulgar profession. Some Roman festivals are still celebrated today. For example, Valentine's day which was called Lupercalia and which honored the Venus, the Goddess of Love. Slaves were allowed to go to the coliseum or to the circus to watch chariot races. Women were excluded from many forms of entertainment for example they would never participate in sports played in the campus.